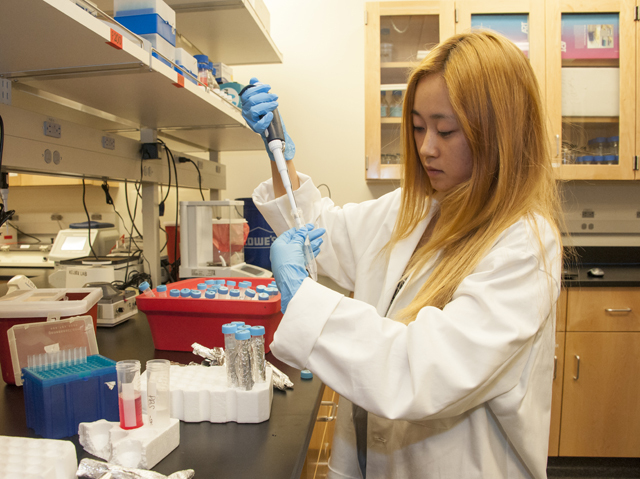 CSUN biology undergraduate, MARC and Presidential scholar Sa La Kim creates breast cancer samples to analyze in the lab. Photo by Luis Garcia. Imagine breast cancer as cells hidden in an invisible house — a house whose blueprints researchers have been hunting for decades. Now imagine suddenly discovering a key support wall for this house, a support wall that could change the future for breast cancer treatment. The report is the first ever to show that the PEAK1 gene is essential at the earliest stages of aggressive breast cancer metastasis. Metastasis is the process of cancer cells moving from its original source – in this case the breasts – to other parts of the body through the blood stream and forming malignant tumors elsewhere. In healthy human cells, the TGFβ protein keeps cell growth and placement under control. But, in some forms of breast cancer, the presence of TGFβ induces a process called epithelial-mesenchymal transition (EMT). EMT causes benign epithelial — harmless tightly packed — tumor cells to transform into malignant mesenchymal — bad loosely packed — cells at an accelerated rate. To date, complete understanding of the mechanism for how this switch occurs is still being sought, but Kelber said that because he and his team identified a central role for PEAK1 in this process, their discovery could help researchers understand breast cancer metastasis better. 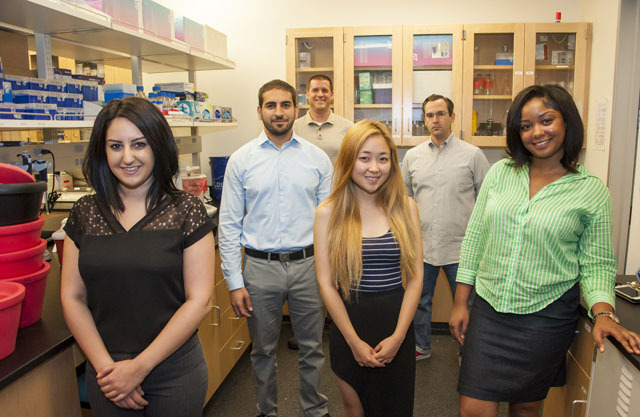 Left to right, CSUN graduate biology students Yvess Adamanian, Armen Gharibi, biology professor Jonathan Kelber, undergraduate and MARC scholar Sa La Kim, graduate students Justin Molnar and Malachaia Hoover stand in one of the cancer research labs at CSUN. Photo by Luis Garcia. Megan Agajanian, who received her master’s degree in biology from CSUN in May and will begin her doctoral work at University of North Carolina, Chapel Hill this fall, is the primary author of the study. She explained that while the entire picture of why breast cancer occurs is not known, discovering the PEAK1 “wall” is a major breakthrough. Kelber noted that since PEAK1 is now identified as part of the tumor growth acceleration machinery in breast cancer cells, patients who show high levels of the gene could be considered good candidates for different cancer treatments. “[PEAK1 over-production] could indicate patients that have a poor prognosis and are better candidates for certain therapies that block the bad TGFβ effects,” Kelber said. Kelber did research and received his undergraduate degree from Cal Poly Pomona before completing doctoral and post-doctoral training at the Salk Institute and the University of California, San Diego. 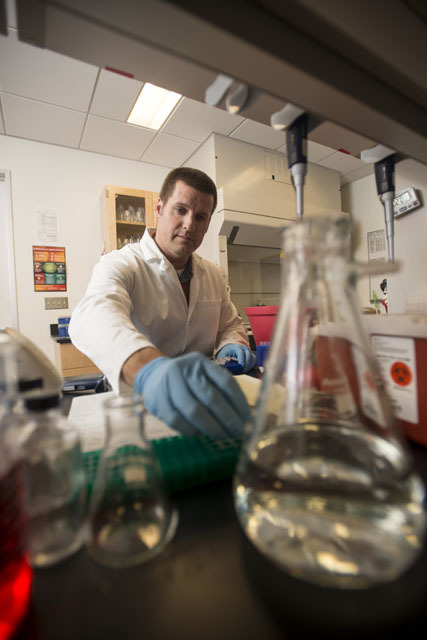 Because he had exposure to hands-on lab work as an undergraduate, he said he was inspired to continue doing research and include students at CSUN. 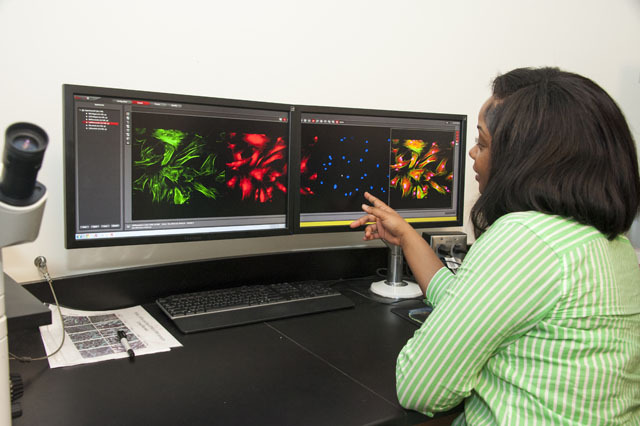 CSUN RISE scholar and biology graduate student Malachaia Hoover discusses the cell samples she analyzed. Photo by Luis Garcia. Kelber’s research team consists of four undergraduate and five graduate students, including Malachaia Hoover. Hoover began as a Louis Stokes Alliance for Minority Participation undergraduate researcher in Kelber’s lab since its beginnings in Fall 2012. She also was a co-author on the article featured in PLoS One and began her graduate research at CSUN in 2014 as a Research Internship in Science and Engineering scholar. “This is what I like to do. [Studying human disease] is my passion, and research strengthened my passion for it,” Hoover said. Yvess Adamanian, a graduate student who has worked in Kelber’s lab since 2012, said ever since she began researching as an undergraduate, her greatest passion is aiming to understand why cancer happens. Kelber said research at any level is an important step in expanding students’ experience. 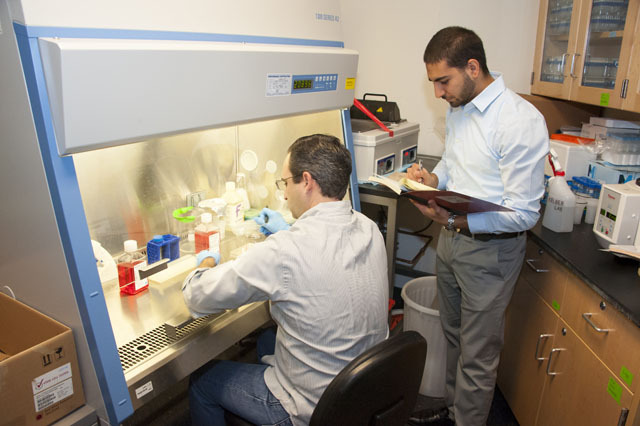 Left to right, CSUN graduate students Justin Molnar and Armen Gharibi take notes and analyze cell samples in the lab. Photo by Luis Garcia. But most importantly, the research conducted at CSUN can change the future, as Kelber and his team noted.